Built in the Middlesex County Architect's Department's style which gave distinctive architectural form to the London suburbs. One of the best examples of inter-war library design in London. Grade II listed with original internal fittings. 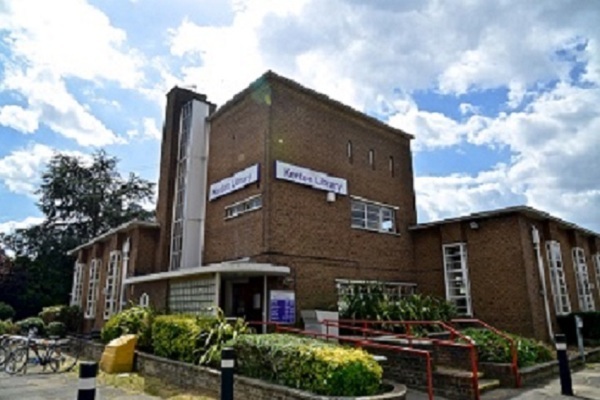 This Grade II-listed public library was designed by W T Curtis and H W Burchett of Middlesex County Council Architect’s Department and formally opened on 4 January 1939 by Councillor D C Ellis JP. The cost was £7,637 plus £980 for fixtures and fittings. Brown brick, flat roof. Single storey, with three storey central tower. L-shaped plan with central issuing desk and reading rooms in each wing. The square tower has two small, latter projections on the south-east corner, one of brick and one glazed. Both wings lit by tall metal windows. Entrance hall lit by east wall of glass bricks. Interior: original staircase, issuing desk and screen, and original bookcases. The main reading room is both side-lit and top-lit by means of circular perforated openings. Included as a good example of the Middlesex County Architect’s Department’s style adopted after 1933, owing much to the work of Wittem Dudok in Hilversum, yet giving a distinctive architectural form of calibre and panache to the London suburbs. This example is especially notable for its boldly geometric composition and the survival of internal fittings. William Curtis was the Chief Architect for Middlesex County Council and Howard Burchett Assistant Architect to the Education Committee. They are now regarded as being among the leading architects of inter-war British Modernism and designed schools, technical colleges, libraries, health centres and hospitals throughout the Middlesex County Council area. Many of their buildings retain their original use. Curtis and Burchett used innovative building techniques, such as steel framing (at Uxendon Manor School in Wembley, 1934) and concrete slab floors supported by pillars (Pinner Park School, 1934). Their designs are characterised by a strong horizontal emphasis offset by a signature central stair tower, as can be seen at Heathfield School, Pinner (1937), technical colleges in Enfield and Twickenham (the former now refurbished and known as Heron Hall Academy), De Bohun primary school in Oakwood (1936) and the Bowes Road library, swimming pool and health centre complex near Arnos Grove station (1939). Rounded rather than square towers were designed for Lady Bankes Junior School in Ruislip (1936), Kenmore Park, Queensbury (1938) and Stanburn, Stanmore (1939). Kenton Library has changed remarkably little over the years, with the children’s and adults’ sections still in their original locations in each wing. The horseshoe-shaped issuing desk has been moved into the adults’ section from the central area to make way for self-service machines but the curved wood and glass screens fronting each reading room have been retained along with many other original features. These include the projecting wooden shelves with rounded ends creating bays in the adults’ section, neatly placed storage cupboards, slatted wooden frames masking radiators and metal door handles, window catches and banisters. The stairs lead to the workroom (originally the Branch Librarian’s room) on the first floor and a staff room on the second. The old coal chute can still be seen in the basement. An unusual feature is the large garden which is accessible to visitors to the library. 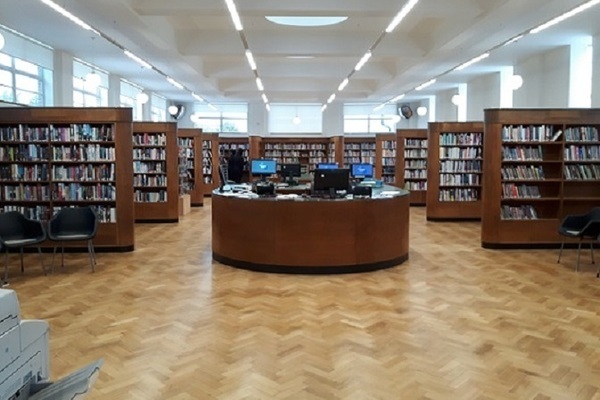 A refurbishment of the library was completed in March 2018, with the creation of improved study spaces with accessible power and USB points for handheld devices, a new meeting space, improvement of stock layout and signage and the installation of a public toilet. 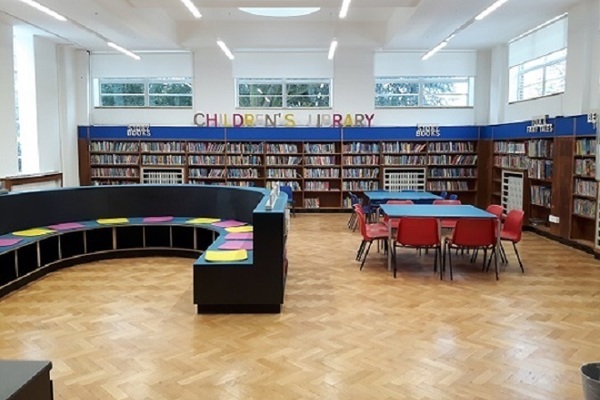 There was also a colourful redesign of the children’s library, improved lighting and restoration of original features such as the wooden shelving and floors. Councillor Sue Anderson, portfolio holder for Community, Culture and Resident Engagement at Harrow Council, said at the re-opening of the library, “What an amazing transformation. I would like to thank everyone who has been involved in the redesign and refurbishment of the library which is now fit for the 21st Century. It’s all part of our plans to build a better Harrow for our residents. I hope that the local community and library users enjoy the new and upgraded facilities which includes attractive public spaces to relax, work and study”.